Six months before the self-determination referenda for South Sudan and Abyei, U.S. policy is not contributing in a meaningful way to peace and justice in Sudan, whether in preventing a return to war between North and South Sudan, or in resolving the escalating conflict in Darfur. The time has come for an urgent rethink of how the United States can contribute to peace in Sudan now, building on the lessons of the recent past. Complicating matters greatly, the Obama administration is not implementing the policy of benchmarks, incentives, and consequences articulated by Secretary Clinton and Ambassador Rice in October 2009, a policy which appears to have either been put on hold or abandoned. The lack of follow-up to the strong words that accompanied the rollout of that approach undermines U.S. influence further with each passing day. The words and actions of key Obama administration officials reveal a largely hands-off approach to critical negotiations focused on peacemaking in Darfur, implementation of the Comprehensive Peace Agreement, or CPA, between the North and South, and reaching agreement on crucial post-referendum arrangements to prevent an all-out national war. The same words and actions reflect a self-perception of marginal U.S. influence in peace-making in Sudan. In a self-fulfilling prophecy, the Obama administration is every day becoming less relevant to the prevention of war in Sudan, just at a time when its leadership and hands-on involvement are needed most. Let’s be specific. There are four areas in which the Enough Project and a significant segment of the activist community disagree with the Obama administration’s words and actions. The Obama Administration’s View: The United States pressured Chad in an attempt to marginalize the Justice and Equality Movement, and then pushed for a peace deal with a number of entities with little field presence. Now, the Obama administration appears to have abandoned the idea of negotiating a sustainable peace deal with the parties to the conflict in Darfur, and instead is backing the idea of a separate internal process of peace-building referred to at times as the Darfur-Darfur dialogue. U.S. Special Envoy General Scott Gration is also backing the Liberty and Justice Movement in Doha, a newly formed rebel faction with little support on the ground and with minimal military significance. This will in all likelihood lead to a deal that further fissures Darfur and makes matters worse, similar to the Darfur Peace Agreement negotiated in part by the Bush administration in Abuja, Nigeria, in 2006. Although there are more American diplomats being deployed to Juba and Khartoum, the U.S. has no permanent presence at the peace talks in Doha or personnel assigned to move between government, rebels, and civil society. The special envoy appears to be concentrating the administration’s efforts on post-conflict development in lieu of securing a political deal, despite the enormous security issues and lack of any effective cease-fire on the ground in Darfur today. Also, numerous voices in the Obama administration are arguing to put Darfur on the back-burner while they focus on the North-South issues. Enough’s Alternative View: The United States needs to ramp up its support of peace in Darfur by deploying a small team of negotiators and experts to revitalize the moribund peace effort. Their efforts should focus on contributing to a draft single text proposal with the full involvement of both armed and unarmed Darfuris that addresses the fundamental roots of the conflict and the issues that most concern the average citizen. Leaving the most powerful armed groups, and potential spoilers, out of the peace equation, and failing to garner the support of local communities throughout Darfur to back it up, will render any peace agreement impossible to implement. All Darfuri factions should be engaged in a revitalized process involving multiple tracks and securing the maximum buy-in from community leaders and civil society at-large. Furthermore, the Obama administration should not deemphasize the Darfur issue in favor of the North-South challenges. The ruling National Congress Party, or NCP, has succeeded in playing these two regions off against each other within the broader international community. It is imperative that the U.S. and other countries focus on both equally and work toward a comprehensive all-Sudan peace. The Obama Administration’s View: At a recent U.S. Committee for International Religious Freedom, or USCIRF, event, General Gration reported his satisfaction with the ruling NCP and the Sudan People’s Liberation Movement, or SPLM, hammering out an approach to North-South negotiations without the United States, and with the African Union High Level Implementation Panel, or AUHIP, and the United Nations taking the lead role as mediators. According to General Gration, the United States has been working hard on the key issues in the CPA, but that it was time for other international actors to take up the helm. He said he envisioned being called upon to assist occasionally, but that because the A.U./U.N. team has assumed leadership of the post-referendum negotiations, the United States would be allowed to concentrate on other issues of concern largely unrelated to these negotiations, such as food security and other functional support systems that would help “keep the place together.” The United States has not deployed full-time, on-site personnel to become embedded in the A.U./U.N.-led process to deal with post-referendum issues, a process that is critical to ensuring a peaceful referendum and smooth implementation of the referendum’s results. Vice President Biden’s recent involvement is a promising development, hopefully presaging more senior administration involvement. Enough’s Alternative View: The United States has a sizeable responsibility in helping to ensure the implementation of the CPA after having been a major negotiator of that agreement. Given America’s special relationship with the South, the Obama administration needs to be deeply involved in pressing for full implementation, bird-dogging the parties, and shining a spotlight on any efforts to obstruct the peace. In addition to the new U.S. personnel in Juba and Khartoum, the United States should deploy additional diplomatic capacity whose sole focus is CPA implementation, so that hot issues like border demarcation and Abyei do not lead to a return to war. The United States also needs to be deeply involved in supporting the post-referendum A.U./U.N.-led negotiations by deploying a team of diplomats and experts in support of the mediation. As AUHIP has been named the lead international facilitator and mediator of these talks, the United States should actively and aggressively offer its resources and its technical capacity to this body. The model to replicate is the successful negotiation structure that produced the CPA. Africa led the talks, with the U.S. and a few other countries providing close diplomatic support, requisite leverage when necessary in the form of sticks and carrots, and high level diplomatic interventions by key Cabinet officials to help move the process forward. The Obama Administration’s View: General Gration and other U.S. officials are increasingly voicing a mantra that the United States has no influence in Sudan. Many in the administration, including the special envoy, operate on the premise that confidence-building measures and incentives are the best way to impact Khartoum’s behavior, but there has been no agreement on which incentives to offer. Given that other powerful voices in the administration are arguing for a pressures-based approach, this has created a stalemate, which also allows those who support an incentive-led approach to contend that their approach has not yet been tried. Enough’s Alternative View: U.S. efforts to build unilateral and multilateral leverage points may be the greatest potential contribution to peace in Sudan the United States can make. Leverage can be built through intensive and high-level diplomacy and the building of a package of multilateral carrots and sticks that are robust enough to get the attention of the parties. Enough is outlining what some of these pressures and incentives could be in a forthcoming publication from the Woodrow Wilson International Center for Scholars. As soon as the United States begins to build that package, and signals to the parties its commitment to seeing real change in Sudan, it will gain greater influence on the outcome of the efforts to support peace in both Darfur and the South. The Obama Administration’s View: The mixed messages emerging from the administration make it unclear what the U.S. wants vís-a-vís accountability in Sudan. While President Obama was expressing his view that negotiations in Darfur are supported by an emphasis on accountability, General Gration was sounding a more negative tone at the USCIRF event, saying that the genocide charges issued against President Bashir by the International Criminal Court, or ICC, will make his job harder. The bottom line is that the United States has not pressed the Security Council for specific targeted sanctions against any individuals subject to an arrest warrant, or even pushed for a Council statement in support of their apprehension, for fear that this will undermine efforts for a peaceful referendum in the South. Enough’s Alternative View: The stronger the United States supports the ICC arrest warrants, the more influence it will have in the long-run in support of peace. Justice is a central component of sustainable peace. 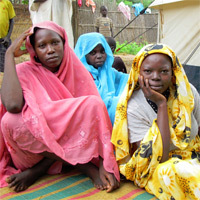 The United States should be pressing other Security Council members to publicly support the arrest warrants, call for the apprehension of the suspects, and introduce targeted sanctions against them, as well as rallying international opposition to any retaliation against humanitarian operations by the Sudanese regime, such as the expulsion of two International Organization for Migration aid workers on July 22, 2010. Regrettably, U.S. policy appears to have abandoned the benchmark-based consequences promised by cabinet members nine months ago, and now is marked by support for General Gration’s shuttle trips to the region, consideration of some small confidence-building incentives, debates over whether to deemphasize Darfur in favor of North-South issues, and the deployment of a team of additional diplomats to Juba to support transitional issues in the South. This represents a fundamental misanalysis of what is needed now. What is urgently required is a full-scale commitment to the kind of negotiations framework that produced the CPA, in which U.S. diplomats and experts were deeply embedded on-site in support of African-led negotiations that utilized international comparative advantages, particularly in the creation and utilization of leverage. Utilizing that lesson in the current context would take two forms: experienced teams deployed to the region to provide close diplomatic support to the A.U./U.N.-led peace processes in Darfur and the South, and U.S. leadership in developing a package of multilateral carrots and sticks to influence the parties’ calculations in support of peace. Having senior officials such as Vice President Biden, Secretary Clinton, Ambassador Rice, and President Obama himself make telephone calls, raise Sudan in meetings, make clear statements of U.S. policy, speak out against human rights abuses, and push the peace process forward will be essential for the success of peace-making in Darfur and the South. The U.S. made a major contribution to peace-making in Sudan in the past decade during the CPA negotiations. Sadly, the Obama administration is not building on the lessons of past success and thus is not positioning itself to play the role that is needed in averting all-out war in 2011.